Natural two tier Slate tabletop fountain that creates a striking focal point wherever placed. The Crystal Cave gently flowing waters provide a calming effect as it soothes and restores body, mind and spirit. 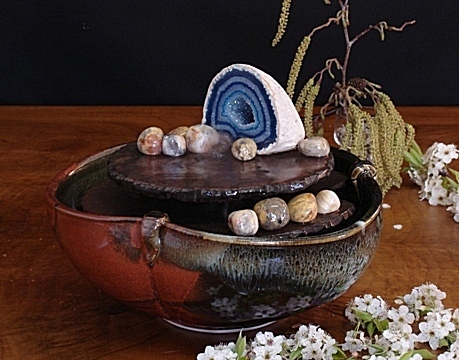 It offers a beautiful crystal agate geode cave and agate crazy lace tumbled stones setting together with a stunning unique handmade in Melbourne bowl. Absolutely gorgeous. Pump and all necessary parts included for easy assembly and operation. Geodes are often used for protection or spiritual aid and growth.